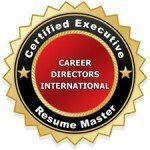 Congratulations on taking this important step to pursue the Certified Executive Resume Master (CERM) credential. A. Proof of your resume credential. If it is not a CDI credential you will need to include a scanned copy of your certificate in your submission. B. Four (4) examples of real-life executive resumes from your professional portfolio.